Dr. Vishal Chhabra is a Psychiatrist, Addiction Psychiatrist and Neuropsychiatrist based out of Delhi and has an experience of 12 years in this field. 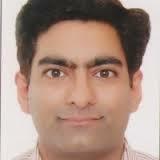 Dr. Vishal Chhabra completed MBBS from KMC Manipal in 2000, Diploma in Psychological Medicine from KMC Manipal in 2002 and DNB (Psychiatry) from KMC Manipal in 2005. He practices at Metro Hospitals & Heart Institute- Lajpat Nagar in Lajpat Nagar, Delhi, Chhabra Psychiatry Centre in Prashant Vihar, Delhi and Tulip Hospital Sonepat in Delhi Road, Sonipat. He is a member of Indian Psychiatric Society, Indian Association of Biological Psychiatry, Indian Association of Social Psychiatry, Indian Association of Private Psychiatry and Indian Association of Geriatric Mental Health. He got Best Paper Award by DPS (Delhi Psychiatric Society) in 2007, he joined Child Psychiatry Fellowship in 2008 and Young psychiatrist fellowship in 2009, he published 10 articles in journals and textbooks.